Created for General Informational Purposes Only – The information presented on Diane M. Brown’s web site has been created for general informational purposes only. The contents of this web site are not to be construed as legal advice. Professional counsel should be sought and obtained from an attorney licensed in your state. 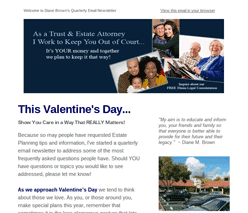 Regarding any third-party content found on this website or accessed through this website, Brown Law Offices does not necessarily endorse, nor is it responsible for such content. 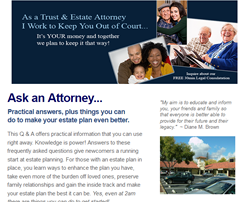 Access to or Use of this Website Does Not Establish or Evidence an Attorney/Client Relationship – Diane M. Brown will not enter an attorney-client relationship on-line, through the Diane M. Brown web site, through any other web site, or through electronic mail or any other electronic medium. It is Diane M. Brown’s policy is to enter an attorney-client relationship through a written engagement agreement, and only where doing so would comply with all applicable laws and ethical rules. For Those Outside the State of California – Should anyone, upon viewing this website in a state where this website does not comply with all laws and ethical rules of that state, seek representation by Brown Law Offices – Please know Brown Law Offices will not represent you. Regarding Transmission of Information To and From this Website – Transmission of information on-line, over the Internet, or through the electronic means can be unstable, unreliable and insecure. There is a risk that information may be intercepted illegally. There may also be a risk of waiving attorney-client and/or work-product privileges that might usually attach to such communications. You should not send information or facts via e-mail relating to your legal problem or question. 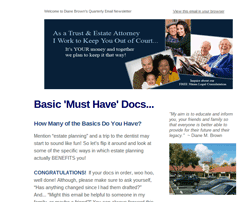 If you are not a client of Diane M. Brown, your e-mail may not be privileged or confidential.